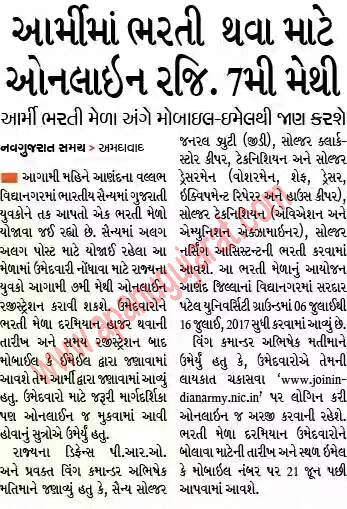 The Indian Army will be conducting a recruitment rally for soldier general duty (GD), soldier clerks, store keeper technician and soldier tradesmen (washerman, chef, dresser, equipment repairer and housekeeper), soldier technician (tech arms), soldier technician (aviation and ammunition examiner) and soldier nursing assistant at Sardar Patil University ground, Vidhyanagar, Anand district from July 6, 2017. 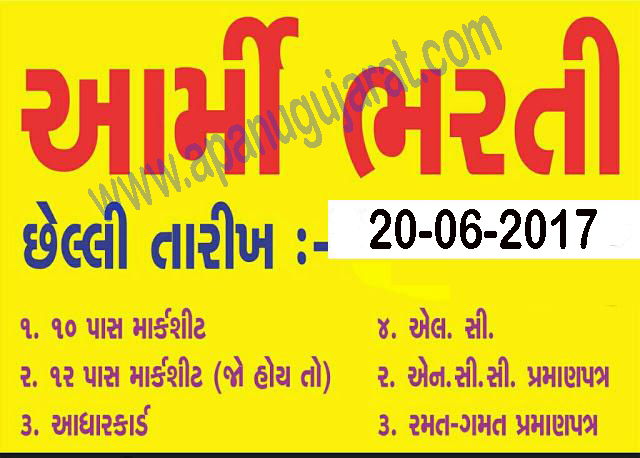 Candidates from Ahmedabad, Anand, Aravalli, Banaskantha, Bharuch, Chhota Udepur, Dahod, Dang, Gandhinagar, Kheda, Mahisagar, Mehsana, Narmada, Navsari, Panchmahal, Patan, Sabarkantha, Surat, Tapi, Vadodara, Valsad districts and Daman, Dadra and Nagar Haveli UTs will be covered under this recruitment drive. Candidates will have to log in to www.joinindianarmy.nic.in to check their eligibility status and apply online only, between May 7 and June 20. Call up messages with date, place and time of appearing for the recruitment will be sent via email and mobile phone after June 21, 2017.